Goliath is a Sulcata tortoise. He was an owner surrender and so large that he was delivered to the sanctuary in a U-Haul truck! 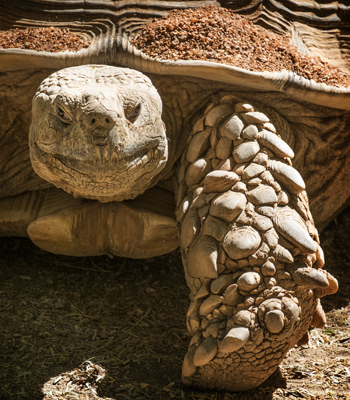 We are unsure of his age, but he's still a "youngster" since these tortoises can live in excess of 100 years. 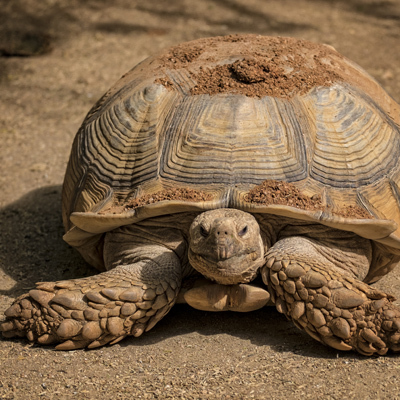 Sulcata tortoises are a non-native species, also known as an African Spurred tortoise. Sulcatas come from the Sahel, which includes some of the hottest, driest areas in Africa. Sulcatas are active year-round and are highly successful in our desert environment. Although people do keep them as pets, because of their long lives and destructive tendencies (they can dig a burrow big enough to upset the foundation of your house! ), they're not a pet for everyone. Goliath hangs out on part of the tour route and he’s not shy, so many visitors have met him. He’s an eating and earth-moving machine! Goliath is a joy as well as a troublemaker. He has broken several water lines which costs us money and time and precious water. When you sponsor Goliath, you not only help to pay for his lettuce and carrots, you help to clean up his messes!